My daughter was looking to update her room as she started high school and wanted something a bit more mature. This set hit all the requirements. Great colors, reminds her of Ivivvia - her favorite clothing line. Since she's had it, her bad has been made every day! 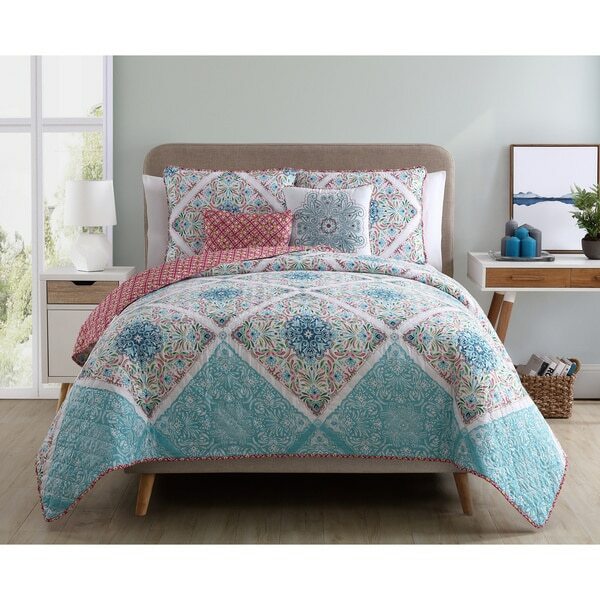 The Windsor 4 and 5 piece quilt set is brightly colored and soft, and features a diamond quilted design. Either one of the two color combinations available is sure to brighten up your bedroom decor. Love these quilt sets. They are so colorful and lively! My daughters LOVES this for her dorm. 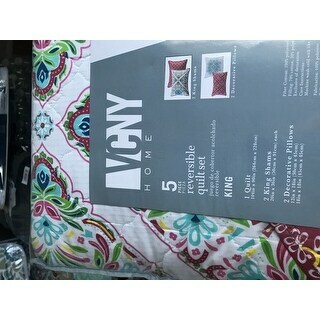 Good quality, and a steal for the price with the matching decorative pillows. Love that its reversible too. Thinking of buying in the other color and holding it for 3 years until my next daughter goes off to school. I. Love. This. Quilt. Love it. Perfect weight. Colors are just as they look online. Fabulous price. I couldn't be happier with it. I'm thinking about buying another one because I like it so much. I received this yesterday and have not yet un-bagged. My initial reaction is meh, it shall serve the purpose of a backup set. I am the worst for not blowing up pictures and looking at the colors/design better. It looked super cute in the picture but the pattern looks a little cheap to me. I have seen mixed reviews on the back color of the quilt, so I have provided a close-up. It is almost a deep red but has a very faint speckling in the color that looks kind of mauve. I can review more on quality and size once opened and washed up. Love this quilt. We own a motel and we find quilts to be very durable. Will continue to purchase from your vast array of well made quilts and bedding. This quilt was a very pleasant surprise. I was looking for an inexpensive refresh for summer . The quilt is lovely, but the feel of it is wonderful. It is so soft. OMG this reversible quilt is stunning. I was looking for a pinch of color in the guest bedroom and this is spot on. Lightweight and beautiful pattern. Beautiful! It is a wonderful quilt! This brightens up our room so much. Super easy to clean and our king size fits easily into our regular sized washer and dryer which is a bonus! Such a beautiful piece! I'm in love! "which pic is the "aqua" color? two diff colors are shown." "Are the colors blue and red, or blue and pink?" In my opinion, they are blue and pink.